Sofa transport. That’s what we’ve been waiting for. The Sofa Bike is the creation of Jacek Holubowicz and was recently displayed at the International Design Festival in Berlin. It has two separate 8 gear hubs, hydraulic brakes which are operated by the front handlebar and dynamic chain steering. We want one. It would get us off the couch- Wait, no. It also has a built in stereo, a 17 mAh battery, and a convertible roof that can be folded down. 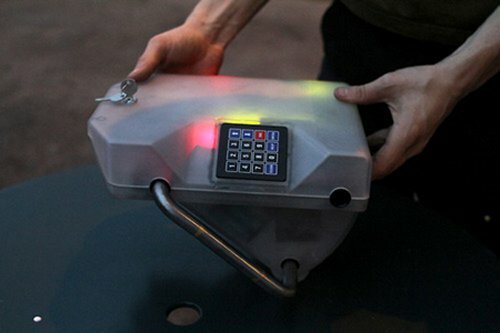 Just as the name implies, this gadget will lock your bike up safe, but when it is not in use, you wear it on your hips. Some of us could use a hip lock that keeps our hips the same size they are now, but this is not that device. It’s a fashion accessory and a super tough bicycle lock in one. The Hiplok is just a steel chain in a nylon sleeve that has a padlock at one end. Wear it while you ride and when you arrive at your destination, just lock it onto a solid structure. Simple. 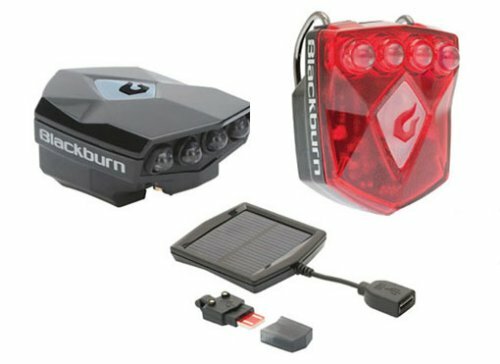 Safety should be your first concern if you ride your bike at night and so Blackburn Designs has created the Flea 2.0 USB rechargeable bike lights, which provide 40 lumens of brightness from four super-bright White Nichia LEDs. People will see you and therefore, you will be safer. You can recharge the battery using a USB port or with an optional solar charger. The front lamp delivers up to 3-hours of steady use or up to 5-hour flashing on a single charge, while the rear red light gives you up to 6-hours of steady use and up to 12-hours flashing on a single charge. This GPS-enabled bike lock tracks your bicycle, of course, but also protects your bike. 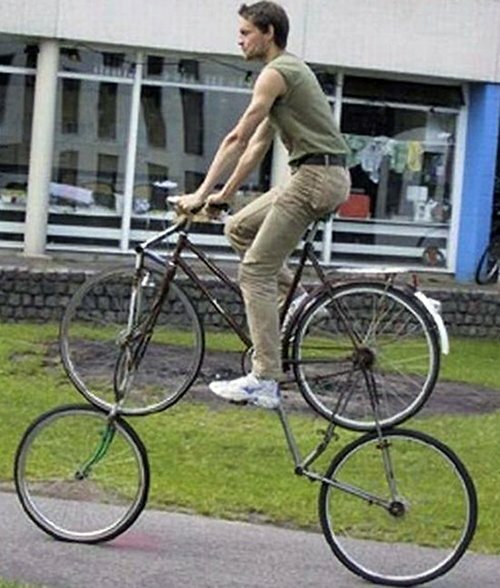 It has to be attached to the rear area of your bicycle. Then with some help from third party mobile applications you can easily track down where your bike is and it can be used to unlock the bike itself. What we like is that it saves you the time and energy that it takes to lock a bike when you need to park it. Now if only these Social Bicycles or SoBi were less noticeable. There are a number of electric bikes and motorcycles on the market today. The good thing about these devices is that they are green and quiet. There are lots of folks that like to commute on electric bikes rather than drive cars. VW is a major car brand that has not been tied to electric bikes before. 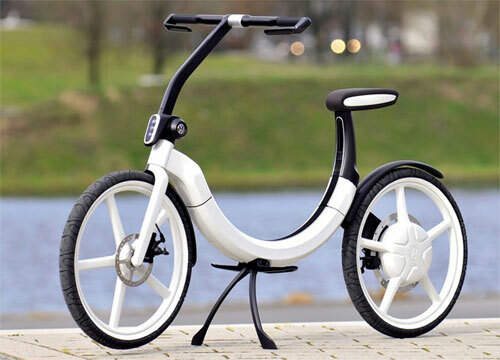 The firm unveiled a new electric bike called the bik.e at the Auto China 2010 show. The bike is designed to fold up and fit into the spare tire area of a car. Several students from Yale University have created a bicycle wheel that does away with the spokes entirely. Pretty awesome. All of our future bicycles will probably look like this one. They should all be patting themselves on the back. But I’m sad to see the spokes go. Where will we put our baseball cards so we can make that weird noise? It also leaves less room for reflectors. If only bicycle spokes had had a spokes-person, perhaps they wouldn’t now be facing extinction. The Segway is fine if you’re a mall cop or something, but what I really want is a UFO that hovers just above ground. That I can stand on and ride. The Air Board is just that thing. 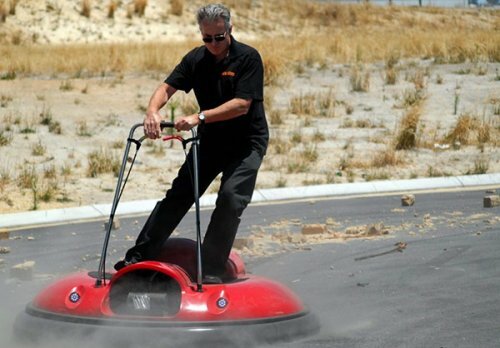 A $14,000 personal hovercraft that floats 8″ above the ground and reaches a maximum speed of 15 mph. It will give you an hour or so on just 1.3 gallons of gas. Not bad. Not bad. But can it abduct smaller lifeforms? Like ants and insects maybe? I sure hope so. This thing steers by using levers and shifting your weight. You know the deal. When you’re just a little tyke getting the hang of riding your bike, you need training wheels. Well, the kids of the future are laughing at you. They are all using the Gyrowheel instead of training wheels, on a Gyrobike. 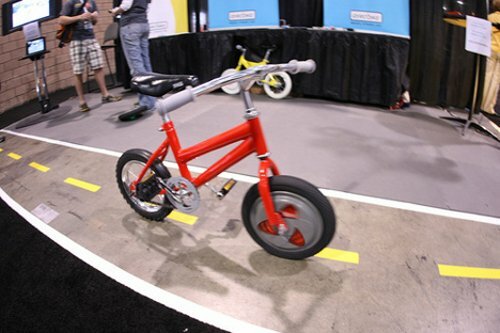 It allows the rider to stay balanced without training wheels and still learn to ride the bike. Think of it as invisible training wheels. The 12-inch wheel replaces the standard front tire, and has an adjustable-speed spinning disc that’s powered by a rechargeable battery. It’s been the same for as long as I can remember. Moms have been forced to push their little ones everywhere. Isn’t it enough that they pushed the kid out in the first place? Moms need a break. 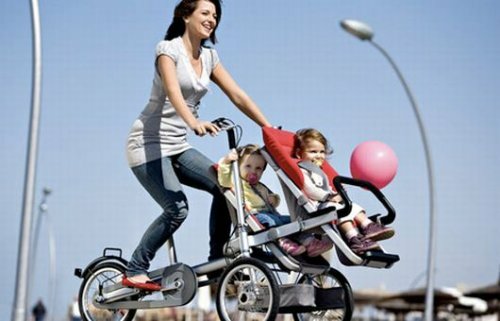 So it’s fitting that on Mother’s day we show you the Taga stroller/trike. This baby folds up so you can fit it in the car trunk for trips. And it also has a wide range of attachments, like a setup for two kids, covered seats for rainy weather, and baskets. 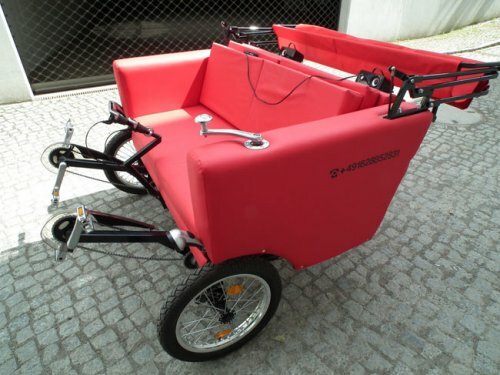 You can even adjust the length of the trike to work with whatever load you are carrying. General Motors and Segway have joined forces to create something larger than a Segway and smaller than a car. 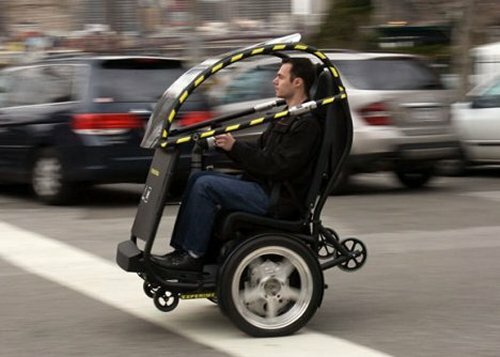 The end result will be the Personal Urban Mobility and Accessibility Project (PUMA) whose goal is to deliver a self-balancing, two-wheeled vehicle that shuttles two people around at speeds up to 35 mph. If you’re keeping score, that’s three times faster than Segway’s 12 mph top speed. It woill have a 35 mile range as well. The vehicle will be powered by a lithium battery and feature a built-in communications device that can “talk” to similar vehicles nearby. Speedfit is a human-powered mobile treadmill invented by Olympic medalist Alex Astilean. Much like Fred Flintstone’s old rod, it uses people power to get it moving. The only real difference is that Fred’s feet no longer have to meet the road. The version in the video is a one or two person model, but Alex wants to create a public transportation version of the treadmobile that will allow a large crowd to power their own mass transit. Sure, it looks silly, but I’m guessing it’s a hell of a workout. No, this isn’t a pic from the annual anorexia bike races, where fashion models bike for charity. It could very well be John Connor’s ride to school after he puts those Terminators in their place and returns to the past as a teen. It’s the Bio-Cycle by Jud Turner. 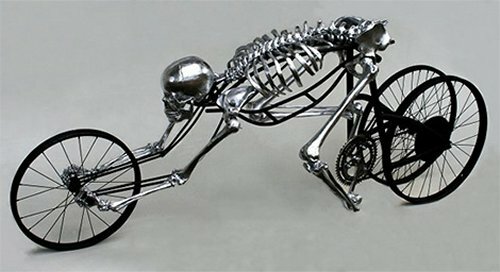 A human skeleton designed bicycle. The skeleton’s hands hold the front wheel, while it’s legs are attached to the pedals and it’s body s the frame. Sadly there’s no where to sit. I love how it looks robotic. Come to think of it, this is probably what robots will do to us one day when they need bikes. It’s dangerous out there for a bike rider. Do you have any idea how many idiots are out there driving vehicles? Having a bike lane on the street that you’re traveling helps a lot. With a bike lane, drivers are more aware of you and you have your own designated space, which should keep you safe. Unfortunately, bike lanes are not on every street. What do you do? Make your own, that’s what. Always have a bike lane with you. 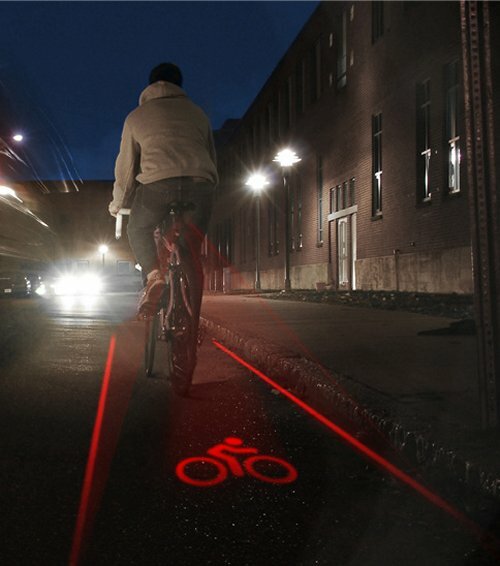 The LightLane is a concept that uses frikkin lasers to project an illuminated bike lane all around you while you are pedaling away. 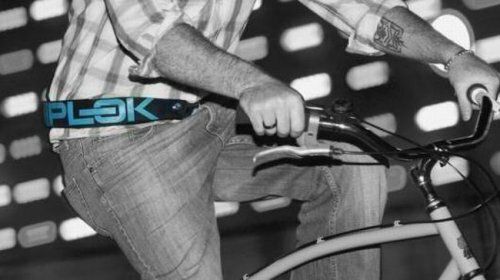 It keeps you visible to cars, which keeps you alive to bike another day. If you’re an enterprising entrepreneur or a stripper who can’t stay put, this is really the perfect vehicle for you and your pimp boss. Just don’t leave a trail of bills in your wake. Or clothes. It’s aptly named the Polerider and I will do my best to refrain from the obvious jokes. The PoleRider was built by three professional industrial designers to withstand immense leverage loads without failing. So I’m assuming that means that larger women can earn a mobile living stripping as well. If you are into that sort of thing. The Polerider makes the rounds in NYC and you can rent it out by the hour complete with pole-dancing girl for $300 for the first, $200 each additional. Look at this ridiculous thing. You’ll break your neck getting off of this bike. It’s just crazy and insane. Therefore we love it. You’ll notice that there’s no chain attached to the lower wheels, which means that the upper wheels are generating all the momentum like another set of gears. 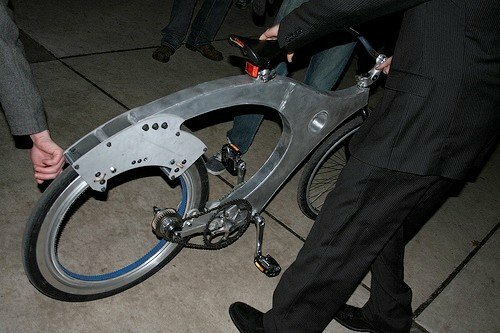 You’ll also notice that they apparently welded a few bike frames together in order to create this monstrosity. I just wish I could see this dude wipe out after running over small rocks. Also, he really should have a latter mounted in this thing. Is it wrong to want to shove a broom handle in his spokes?